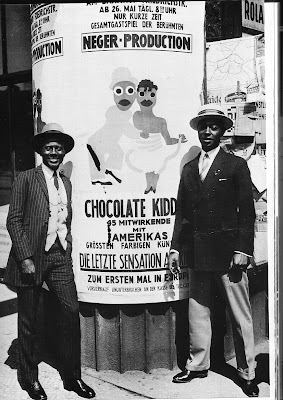 In 1925 New York bandleader Sam Wooding's all-black jazz revue Chocolate Kiddies toured to Berlin (photo above). Among the audience were composers Ernst Krenek and Kurt Weill. Krenek had studied in Vienna under Frank Schreker, and was married Gustav Mahler's daughter Anna for a short while. His compositions include an opera written to a libretto by the expressionist painter Oskar Kokoschka. Chocolate Kiddies inspired Ernst Krenek (photo below) to write his jazz influenced opera Jonny Spielt Auf (Johnny Strikes Up) which was premiered in Leipzig in January 1927, and opened at the City Opera in Berlin ten months later. Jazz was anathema to the ascendant Nazi party due to its African-American origins, but despite this Jonny Spielt Auf achieved major success with audiences across Europe, and was translated into twelve languages. The Center for Jazz Arts describes the opera as having "jazz-infused harmonies, syncopations, and story-lines; an African-American jazz-artist hero (Jonny); interracial romantic story elements; innovative Expressionist and Bauhaus influenced stage sets; and an unconventional incorporation of modern technology into classical opera, such as telephones, radios, and automobiles." Ernst Krenek's name was put on the Nazis' blacklist in 1933. He was based in Vienna until 1938 but was expelled after the Anschluss. He lived in the US until his death in 1991, although in the last decade of his life he spent summers at the Arnold Schönberg House in Mödling, near Vienna. The year after his death in Palm Springs Krenek's remains were transferred to an honorary grave in Vienna. * The 1993 Decca recording of Jonny Spielt Auf, with Lothar Zagrosek conducting the Leipzig Gewandhaus Orchestra, is available through Amazon Germany. There are some brief audio extracts via this link. The slightly more idiomatic Vanguard recording (left) with the Wiener Staatsopernorchester and Lucia Popp is deleted, but is still available from Amazon resellers. Visit the Ernst Krenek Institute website via this link. 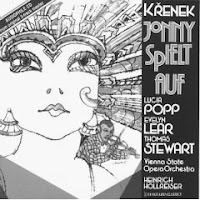 I attended a lavish, Brechtian, musically superb production of Krenek's "Jonny Spielt Auf" at the Vienna State Opera five or four winters ago, which was under the baton of Seiji Ozawa. I recall wondering then whether it would have been possible for the fine production to travel to the Metropolitan or New York City Opera (or to London). I remember concluding then that it would not be possible at this time, due to the opera's African-American jazz-artist hero (Jonny) being, in fact, conceived of dramatically as a then stereotypical African-American criminal outsider. That is, I could see Seiji Ozawa carrying off the Vienna production in close to "closed" musicological, socio-historical study conditions; but I could not see him further introducing the work to audiences in America or the UK as a vital, forgotten opera; and one possibly worthy of revival for an expanded canon. Musically, the work is fine and just as worthy, if not worthier, than Kurt Weill's "Aufstieg und Fall der Stadt Mahagonny," which James Levine and the Metropolitan mounted in the early 1980s, and toured throughout some of the United States. I'm sure that your other readers can name numerous other operas of this period in European music history which could be less problemmatically revived today in the UK or the United States/Canada/Australia (or in the Russian Federation/Ukraine, Japan, or China). I don't think the problem with Jonny spielt auf is so much the stereotyping as that it's had a history of white singers doing it in blackface; Jonny actually is seen as being a representative of the future, while the composer, Max, represents the Dead White European male who will get swept aside by Jonny and the Jazz Age. I haven't read the libretto in ages, I'll have to see if there's anything offensive in it. I'd love to hear it in the theatre. Long Beach Opera (here in California) staged it years ago, but they're too busy doing stagings of lieder cycles (!!) these days to bother with staging actual *gasp* operas. Opera North did it in 1984, too. Los Angeles Opera is doing excerpts of it in their upcoming Recovered Voices concerts, with music by Schreker, Korngold, Braunfels, Zemlinsky and so on. Henry, I think that once you reread the libretto (or experience the work live) you will see that the story is, unfortunately, less sympathetic to African-Americans or African-Europeans than their simply being exemplary representatives of the future and a future European, European-American, or world music. As I mentioned, I was fortunate to have experienced the work's fairly fine music in a major theater, but wish that I could feel that the work was dramatically worthy of touring to the Metropolitan or London or Los Angeles or Washington National Opera companies. I also recall now, myself, being more struck then by the beauty of the work's neo-romantic writing than by its less-well developed or integrated jazz-inspired writing. Thanks, Henry, for your other thoughts, as well. Perhaps you would like to mention your favorite three or four "lost" operas by Schreker, Korngold, Braunfels, Zemlinsky, and others; which you would like to see mounted in Los Angeles, New York City, London, and elsewhere. As you probably know, James Conlon has been rumoured to be the leading candidate to replace Leonard Slatkin at the helm of the Washington National Symphony orchestra. In that capacity, one wonders whether he might not lead some of this "lost" European operatic repertoire at the Washington National Opera, the MET Opera, and the Los Angeles and San Francisco Operas, as well. And as you also know, the MET will be producing in a few weeks [in a post-modern production] Hofmannstahl and Strauss's "Die Ägyptische Helena"; an opera which has been championed in America by concert opera organizations for the past generation. I will assume that there have also been major productions of it in Germany and Austria; and perhaps concert versions of it in the EU and UK, as well.